Is global warming due to human activity? Here’s why it doesn’t matter. This week at Darden, our ethics class begins exploring sustainability and its impact on business in the global economy. Normally, ethics is a late-week class for me, but I had an opportunity (long flight) to read ahead over the weekend. As a Darden student, I know when you have these opportunities, you take them. Reading the case and the technical notes on the “shades of green” prepared me to listen to a radio talk show that I tuned into on the drive home from the airport. The host spoke critically of last weekend’s “Earth Hour” event and former Vice President Al Gore’s recent interview on 60 Minutes. She was clearly skeptical of the idea that global warming is caused by human activity, despite mounting evidence and the growing concensus of the scientific community. There are still very viable theories that imply that the Earth’s rising temperature is a result of naturally-occuring phenomenon, and the climate change skeptics cling to these theories and espouse the old party line, which asserts that sustainability, particularly the kind that accompanies reduced carbon emissions, is expensive. It hurts the bottom line… it affect the competitiveness of our economy. It can only be achieved at the expense of economic growth. Why should we pay all these costs for something that is unproven? 1) The connection between human activity and global warming is uncertain. 2) If global warming exists and persists, the impact would range from (best case) a small improvement in the quality of life to a catastrophe (worst case). If we multiply all the probabilities by the associated costs (specifically, net present values) and sum the resulting expected values, we can get a handle on the expected risk. 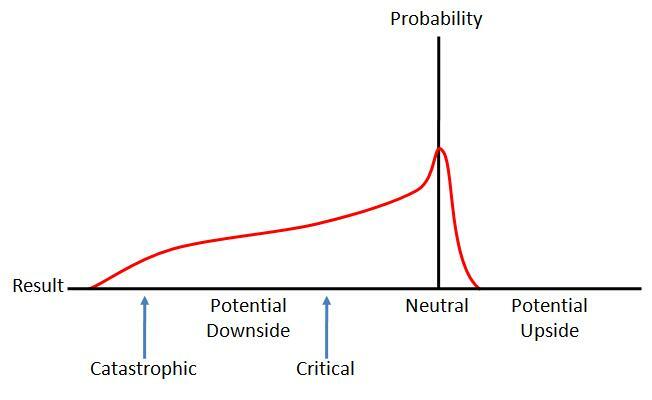 The fact is that the downside risk is so high (the end of everything we know) that the expected overall risk makes the average cost incredibly high, regardless of the assignment of a significant probability to the increasingly improbable theory that global warming occurs naturally (or, even less likely, that it doesn’t exist). From ethics class, I know that this is a classic example of “Pascal’s Wager”, which postulates that one may as well be religious because it doesn’t cost much to be so, and the potential upside (heaven), and downside (hell) indicate the decision is easy (Freeman, 11). But what of the cost of cutting our carbon emissions? If they are prohibitively high, perhaps they outpace the costs to society mentioned above. So, why this persistent and active skepticism? Where is this coming from? I have a few thoughts on the matter. 1. Carbon emission abatement demands collective action restricting individual behavior. This is counter to the rugged individualism that many skeptics believe drives us to improve ourselves, and thus society. 2. 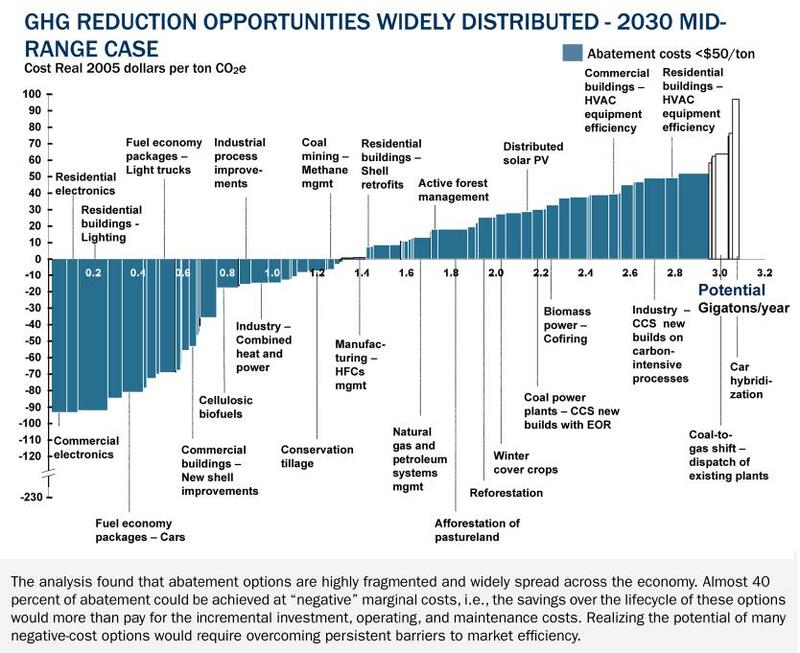 The “cost and competitiveness” stigma is prevalent among those who haven’t yet realized that there are ways to reduce carbon emssions without paying prohibitively high costs or affecting competitiveness. 3. The environmental agenda has become the domain of the left, and any ideals espoused by one political party, regarless of merit, are likely to receive significant criticism from the opposing dominant party. 4. Some people are just thick-headed and need to read more. So, happy Earth Hour everyone. And buy a high-milage car, please. Now that spring break is over and the recruiting season is officially behind me (having accepted an offer for the summer) I thought it might be a good idea to share some of more memorable moments and experiences of the recruiting season. During my undergraduate education, I rested easy with the knowledge that my post-graduate employment was assured. As my friends sweated out their recruiting efforts (attending job fairs, dropping resumes, shaking hands, preparing for interviews, etc. ), I could relax, knowing that my ROTC obligation included a guarantee of employment as a military officer for pretty much as long as I wanted it (which turned out to be 5 years). So, the result was that, prior to this winter, I hadn’t had a real job interview since… well, I landed a job selling shoes at a local shopping mall when I was 19. Somehow I knew that that wouldn’t exactly serve as quality experience for the rigor of consulting interviews. So, I took advantage of the myriad of resources available at Darden to prepare for my interview experience: mock interviews with Career Development Center (CDC) reps and experienced second-year students, workshops, InterviewStream (online software/web-cam tool that lets you practice your interviews and review your performance), and lots of practice with my fellow first-year students. 1. CDF Consulting: Mike, as you know, we really place a high value on quantitative skills at CDF Consulting, and we noticed that during your undergraduate education, you received a poor grade in a math course. Can you reconcile this for us? Me (thinking): Oh my God, really? REALLY? That was, what, 8 years ago? How do I answer this? Should I tell them I partied too much and skipped too many classes? That I was 19 and somehow underestimated a class called “Vector Calculus”? Who would have guessed that would be hard? Me (saying): I appreciate the opportunity too address this. I overscheduled coursework that semester and I was working too many hours in a part time job. I learned an important lesson about prioritization during that experience, and you can see that in subsequent semesters my grades in even more complex quant courses improved dramatically. Additionally, I am performing very well in my quant coourses here at Darden, including Decision Analysis and Finance. Afterthought: I handled this one fairly well, but my surprise (and horror) at having an 8-year-old grade pulled off my transcript and put before me must have registered on my face. I didn’t receive an invitation for a second-round interview with this firm. 2. Beer-Jamison Thompson Consulting: No offense, but you look young. How do you think you’ll handle working with much more experienced managers when you’re in a consulting capacity? Me (saying): That’s interesting, because I ran into the credibility gap problem in the military quite often and early. I came into a job where I was 22 and was, fresh out of college, responsible for leading 40 Soldiers. Most of my subordinate leaders were many years older and were experienced. I learned very quickly that the most important thing was to focus on implementing change as needed without insulting anyone or coming across as condescending. Taking ownership of the problem, instead of assigning blame, is the attitude… simply saying “we” instead of “you” made a lot of money, and I think it would help with experienced clients as well in a consulting role. Afterthought: I was ready for this one, and I nailed it. I was not offended at all (in fact, it was a happy boost to my ego! ), and it gave me an opportunity to share a part of my experience that would conceivably help me in my next career. I received an offer from this firm. 3. Oversmell Consulting (email): We found your credentials impressive, but at this time, due to the highly competitive process, we have made our selection for the next round and will not pursue further interviews with you at this time. Me (no kidding): This is interesting, not because this is what we call a “ding” email, telling me that they’ve decided to forgo further consideration of my candidacy, but because I never even interviewed with this firm. After receiving other offers, I dropped my interview with this firm, in an effort to give my slot to an alternate. Nonetheless, they decided to “ding” me… I guess it truly wasn’t meant to be. Darden (and all the resources that comes with Darden) really prepared me for most of the curve balls I saw during recruiting. For all these crazy ancedotes that I have (and only the top three are listed here), there are many, many more that I’ve heard about from my fellow classmates. Sitting on an accepted offer at Spring Break is a great place to be, but the effort isn’t truly over until the last classmate and friend has also secured a good offer. It’s the least I could do in return for all the help I’ve received this winter. Last week marked the end of the third quarter for Darden’s first-year class, and as such, it was a week of exams. First-year finance? Monday. First-year global economics? Tuesday. First-year strategy? Wednesday. See a trend here? To the outsider, Darden’s exams require a little explanation. First, all exams are take-home. You pick them up in hard copy (or, in a new trend, they are emailed to you to help reduce our carbon footprint) after 8 AM. You then have five contiguous hours (snack and bio breaks still count in your time; printing, thankfully, does not) to complete the exam. After you’ve finished and printed your output (which frankly is often the most stressful part of the exam, as printers always seem low on toner and paper and just plain on energy during exam week), you walk (run) to the library to turn it in by 2:00 PM (2:59 PM). The deadline is actually 3 PM, and half of the first-year class can usually be seen at a trot moving toward the library after 2:30. Technically, 8 AM to 3 PM is 7 hours, but you can only use 5 hours of that time on actually doing the exam, a constraint that is limited only by the honor code but that, in my observation, is strictly adhered to across the board. Although the exams are take home, many students will reserve a study room, or take them to the library or an empty classroom. I do take my home; I find the walk to be a good way to clear my head before I get started, and I like having my workspace set up on my dining room table. Take-home means that it’s open book and notes, which sounds great, but the exams are carefully designed to really push you in the given time, so time management is critical. You can’t expect to learn along the way in a five-hour exam… you’d really better know it before you get started and resort to your references only for the details (CAPM formula, unlevering your beta, etc.). All in all, exams are actually a pretty decent time at Darden. For once, you get to focus on one subject at a time, and you’re finished at 3 PM when you turn the exams in. And, this time, we headed off on spring break once our final exam (Decision Analysis) was completed. Many students take advantage of Darden’s highly recommended Global Business Experience (GBE), which is a sponsored trip (you actually get course credit) to a foreign country to attend a business school class there by day and enjoy the city/country by afternoon and night. Darden offers first year trips to Mexico, Brazil, Argentina, Czech Republic, Spain, and some others. Second year trips can include South Africa or China (second-years get two weeks for spring break, which facilitates longer trips). I decided not to go on a GBE this year… I may take one of the longer trips next year. This year, I am going on a GSE (Global Surfing Experience) to Costa Rica’s west coast (Tamarindo Beach). I’m taking surfing lessons from a guy named “Flash” and eating at a bar under my room that has an open view of the Pacific. The breeze is wonderful, the scenery is great, and the people are very friendly. The dollar still stacks favorably against the Colonaes (local currency) so everything is affordable. Best of all, the water is very warm (no wetsuit needed) and the waves are stellar (6 feet plus). I guess I just decided to leave class… in class, at least this week. Last night I went to a local rodeo, which was beyond authentic. I was one of only maybe two dozen foreigners there out of thousands of people, and the cervezas were cold and the tequila flowed freely. Our guides from the hotel made sure we didn’t eat anything too risky or throw ourselves into the ring. “El Toro es Guapo”… basically, respect the bull. It was a great time. Tonight we’re having a bonfire on the beach and we’ll get to meet other guests. I’ve already made some great new friends on the trip. I highly recommend Tamarindo and Witches Rock… when the plane lands at Liberia and you get off and see that the entire airport is contained in a series of what looks like picnic pavilions, you’ll know you’re in the right place. Sometimes life gets busy and coming to a place where the pace of things just seems slower is what is needed to refresh the soul. I hope to bring not only a bit of sunburn but also an improved sense of well-being home with me in a week. Gratitude is a fickle feeling. We feel it genuinely in a rush, but in truth, it usually fades quickly. In order to capture the moment of gratitude before it vanishes, we often take the formal step of writing a thank you note to the person or entity that inspired it. Beyond the social etiquette requirement, actually writing a quick note of thanks for a deed done on one’s behalf is a way to mitigate the fleeting nature of gratitude. In full disclosure, I was rather lousy at it as a child. Christmas and birthday gifts were gratefully received, but the response was usually a hasty thank-you phone call I honestly saw only as a temporary impediment to full enjoyment of the gift. High school graduation was very much a turning point in many respects, and it was at this time that social maturity began to force my hand… quite literally. People were not merely giving gifts, they were giving their true best wishes, their goodwill, and, quite frankly, a pile of cash that would have taken me weeks to earn at the job I had at the time (bagging groceries). So now I’m a committed thank you note writer. As I left the Army and prepared to enter Darden last summer, I reflected on those who had helped me get to this point. I realized that a number of very important teachers in my life, particularly those who made a very important impact during my primary and secondary education, had heretofore been thankless for their efforts. After some research into contact information, I wrote my notes. In the replies I received, I found a sincere note of interest and a sense of happiness that things were going well. As the summer internship recruiting season has wrapped up, I have found myself with the good fortune of choosing between several appealing offers. After some research and careful consideration, I chose to join McKinsey this summer. It’s worth noting that I am not alone at Darden with an offer from a top quality consulting firm. This recruiting season was a banner one for Darden students interested in consulting. Primarily, I think it’s appropriate to credit the dedication of Darden alumni, second year students, members of the consulting club, and the Darden Career Development Center. But some of the credit must go to my fellow students in the first year class. We practiced and drilled together extensively prior to interview season, and we shared tips and tactics we learned along the way. This broadening of knowledge isn’t really surprising though… it’s really inherent to Darden’s collegial culture. True, the selectiveness and practical constraints of the firms in question meant that some of my friends and classmates didn’t receive a consulting offer. But we as a cohort collectively share the result of this inevitable outcome as if it happened not to one of us, but, rather, to all of us a group. Of course, we look forward to helping everyone find a fitting offer next year. With multiple offers, I had to share some bad news with companies and firms that I really liked. I had to tell them I had decided to go a different direction this summer. I made a few select phone calls, and then I sat down with a stack of thank you cards. The time and money invested in the recruiting process by these companies, in many cases motivated by the best intentions of dedicated Darden alumni, certainly called for a few moments of my time to capture and display my gratitude before it faded in the light of my excitement for this summer’s opportunities. This deed done, I looked forward to a scheduled visit to the office where I’ll spend the summer. I was scheduled to make the trip last weekend, but weather intervened and the trip was postponed to this weekend. I rescheduled the flight for Friday morning, departing from Charlottesville at 6:45 AM. Cognizant that this was a reading day (meaning I normally would have no classes and would probably sleep in a bit), I set two alarms to pull myself out of bed by 5 AM to make the flight. I woke to no alarms, and my watch read 6:40 AM. Panicked, I leapt from bed. Now what? I had obviously missed the flight… I considered my options in a flash, and decided I would pay for a ticket at my own expense on the next available flight, and that I would probably have to travel to Richmond (a 1.5 hour drive away) to make it to the office in time to make the trip worthwhile. I went to my computer to look up the phone number for the airline. My browser was still open from the night before, showing the flight status. I refreshed the screen. The 6:45 AM flight that I had missed… was cancelled. I hadn’t missed it after all. A small miracle, given that the weather was fine outside and was also fine in New York. I called the airline, and they scheduled me (at no expense… the flight was cancelled, after all!) on the next flight from Richmond. I would have to hustle to make it, however, given the drive. The drive was torturous. Construction, an accident, and the accompanying heavy traffic in Richmond put me at the airport only 30 minutes before departure. After checking in, I ran to security, and was stopped cold. The line was long and barely moving. It seemed everyone else had flights leaving soon too, and the frustration in the air was palpable. I took a deep breath. A monitor nearby indicated that the flight was delayed by 15 minutes. I realized that it would be close, but that I would probably make it. After pulling my belongings from the belt (coat, jacket, backpack, luggage, belt, shoes, wallet, boarding pass, laptop, and baggie with liquids and gels) and shuffling them into their respective places, I dashed off to the gate. I boarded the flight just in time. As the flight crew prepared to separate from the jetway, I began to relax. I might actually make this weekend happen, after all. And then, a flight attendant at the front of the plane called my name. “Yes, here,” I called back, a sinking feeling in my stomach. What else could go wrong? Was I being bumped at the last minute? Would they pull me off the plane? “You forgot your computer. You left it at security,” she said as she strolled to my seat and handed me the worn Darden bundle laptop. “Oh… oh,” I stuttered, “th-th-thanks. THANK YOU!” The realization of how bad my weekend could have been dawned on me. Exams are next week, and all my old casework is on my laptop. And I never back anything up. I don’t know the name of the person at security that found the laptop sitting on the belt, unclaimed. I don’t know who it was that decided to open it, boot it up, and see my name on the login screen (I don’t have it listed anywhere physically on the machine). I don’t know who the ticket counter person was who looked up my name (frankly, quite a common name) and found which flight I was on. And I don’t know who brought the computer to the plane and gave it to the flight attendant. But they all saved me from a very, very bad weekend and probably a bad week as well. Also, Darden bundle laptops ($~2000) carry a warranty that covers everything… spills, drops, meteors. But they don’t cover theft or loss. Sometimes the greatest measures of gratitude go to those we don’t know… those who go above and beyond their everyday duties to keep the world a better place for all of us, and especially for the absent-minded among us. For these people, the thank you notes go unsent. But our collective human commitment is to do the same for others when given the opportunity. In a way, I suppose that’s even better.